So Project Life scrapbooks are all the Pinterest craze at the minute! I don’t think they’re anything new, I’m pretty sure LilyPebbles did one for 2014. She’s the unofficial Queen of Project Life. Now for 2015, all the bloggers and crafters in my life seem to be making one! They’re not the cheapest, nor are they the most expensive thing in the world if you manage it. Essentially, you buy a £20 book/folder, and buy pages, and accessories, like stickers, tape, card, etc separately. Though, as I’ve mentioned before, I’m a completionist of everything I start. Buying every Marvel Cinematic Universe DVD seemed like a reasonable goal in 2010, yet here I am in 2014 with around 10 or so, some I haven’t even watched yet, and there’s many, many more Marvel films to come. So I imagine a Project Life book would end up setting me back £100s over the year. £100s that I really don’t have. For a while now, since December 2013, I’ve been making my own, very basic, scrapbook/photo albums. I guess they’re a form of Project Life in themselves, although, not as pretty, not as Pinterest and not as impressive. I’m really selling it aren’t I? Little reminder, if you want to view these pictures bigger, just click on them and click through! This works on every single post! A scrapbook: I always go for Paperchase’s offerings, I’ll take anything Paperchase puts out. These are around £10 I believe. I am in love with the world map one and I want that design to be on everything I own, from a car down to even toilet roll. Photo corners: Here’s a stock photo, as it looks like I must have left mine at home! I can’t find them in my room here anyway. These are what i says on the box! You stick them in your book, and slot your photo in! 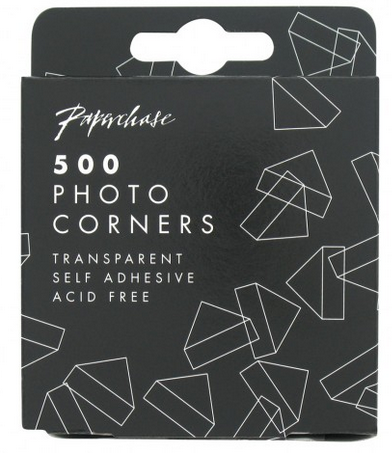 Considering Paperchase isn’t usually the cheapest, it seems to be the best place to buy photo corners from! This pack of 500 will only set you back £2. whereas in other stores you’ll be paying £5+. You can find these near the photo frames and photo albums in the store. Coloured pencils/pens: If you feel so inclined! I only use these a little bit. I kinda want to use them more. Taking this artsy picture took far longer than anticipated. I had to google the rainbow order of colours and I think I probably got it wrong. Stickers: I haven’t used stickers but I imagine you could make it awesome with some. Maybe I’ll start hoarding stickers and deck mine out. 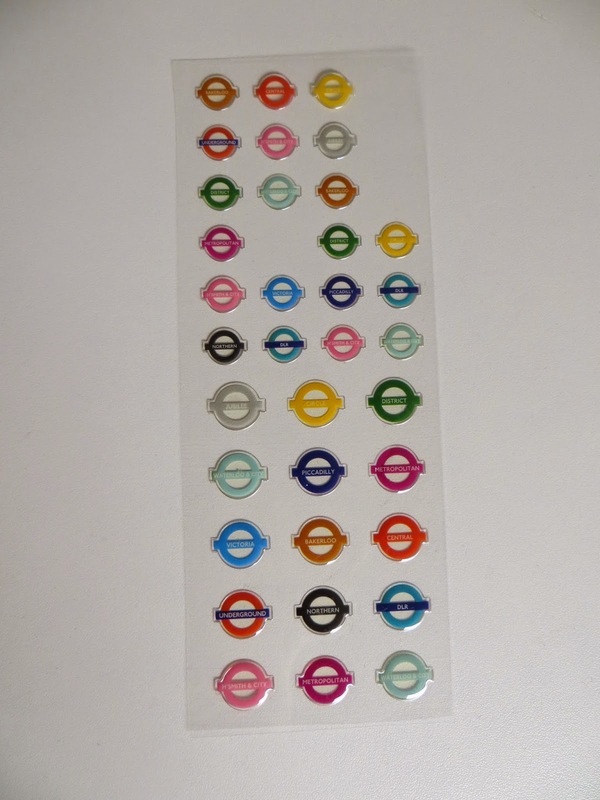 These stickers will probably get added to photos of the times I visited London last year. Oh- and photographs of course. I completely forgot about that one. I always order mine online from Photobox but it looks like their prices have risen over the New Year. The total cost of these is pretty low. Especially if you really utilise getting free prints from photo websites. Most only charge shipping for 50ish prints if you sign up with an unregistered e-mail address. Seriously, utilise this. For these photo albums I must have placed 5 or 6 orders, so it’s saved me a ton of money browsing photo printing websites. I’ve gone quite basic for my second album. At the minute it is literally just black pen. I think I might go back and make it more exciting. Maybe print some off as polaroids or in different styles, it’s 2015, let your craftlust go wild! Maybe add in event tickets, or movie tickets, or whatever you have from a day you’d like to remember! I keep my tickets elsewhere, on a little pinboard, but I’m thinking I might buy another scrapbook for those. Or maybe just add them in to these ones at another time. Yes, there are selfies of my Halloween costumes included. In the future I’ll wanna see a good picture of them, I’m sure! I think it’s a good idea to keep hard copies of photographs. You have all of the photos you want in one place, rather than trawling through a billion Facebook albums. And whilst on the internet, they seem pretty secure, what if your token photo taking friend (we all have one) deletes their account?! The pictures are gone forever!!! Essentially, trust no one in charge of things you want to keep, unless you totally trust them. Life lessons with an exam crazed blogger. This page could be made so exciting. Making this post is motivating me to make my own albums look much better than they currently do. Can you guess which one of the two is full? Maybe sometime soon, we’ll move onto a more advanced form of craft. I imagine 5 year olds can do more than this, but crafting at a 5 year old level is better than not crafting at all. Saying crafting again and see if it still sounds like a word. This is most likely going to be my last post for the week! Probably until Tuesday, by then I will have done my exam! That’s scary! But exciting, because then I will feel less guilty for spending an hour a day or so on here.